A recent project presented me with the opportunity to think about the universe of possibilities for the look back measurement method. The research led me to rethink something that has bothered me since the final regulations were released in February 2014. Astonishingly, the final regulations provide examples of look back measurement method time frames that do not conform to the rules for each date of the year. Consequently, an employer utilizing measurement periods used in some examples in the final regulations could be assessed a penalty under section 4980H for certain dates of the year. To see why there is an issue it is important to understand two rules. First, the Administrative Period has to be 90 days or less. This 90 day period includes all days starting with the employee’s start date and the beginning of the Stability Period associated with the Initial Measurement Period. The second test restricts the Initial Measurement Period plus the Administrative Period extending beyond the last day of the first calendar month beginning on or after the first anniversary of the employee’s start date. 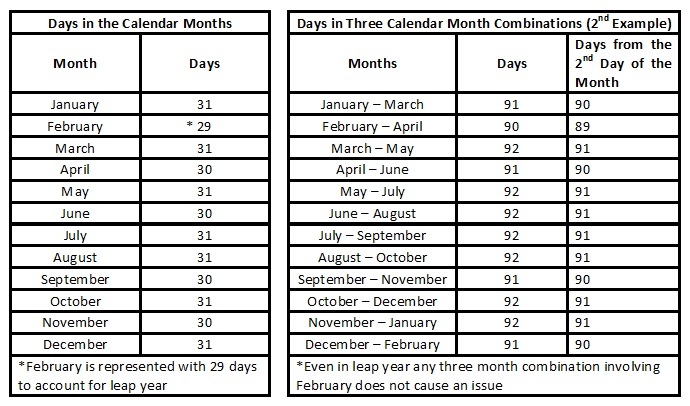 In simpler terms this rule caps the length of the combination of the Initial Measurement Period and the Administrative Period to 13 calendar months plus a partial month if the employee’s start date is not the first day of a calendar month. The final regulations restrict an employer from using different measurement periods for different employees to: (1) different applicable large employer members; (2) collectively bargained employees and non-collectively bargained employees; (3) each group of collectively bargained employees covered by a separate collective bargaining agreement; (4) salaried employees and hourly employees; and (5) employees whose primary places of employment are in different States. This is significant because it prevents an employer from applying different measurement periods based on an employee’s start date. Now that the relevant rules have been discussed the next items to review are the examples at issue. The two examples are set out in the final regulations at section 54-4980H-3(d)(5) examples 2 and 3. The employer offers all of its full-time employees (and their dependents) the opportunity to enroll in minimum essential coverage that is affordable and provides minimum value. In the second example Employer Z hires Employee A (a new variable hour employee) on May 10, 2015. Employer Z uses an 11-month Initial Measurement Period that begins on the start date and applies an Administrative Period from the end of the Initial Measurement Period until the end of the second calendar month beginning after the end of the Initial Measurement Period. Employee A’s Initial Measurement Period runs from May 10, 2015, through April 9, 2016. The Administrative Period associated with Employee A’s Initial Measurement Period ends on June 30, 2016. Employee A has an average of 30 hours of service per week during this Initial Measurement Period. In the third example Employer Z hires Employee A (a new variable hour employee) on May 10, 2015. Employer Z uses an 11-month Initial Measurement Period that begins on the first day of the first calendar month beginning after the start date (emphasis added) and applies an Administrative Period that runs from the end of the Initial Measurement Period through the end of the second calendar month beginning on or after the end of the Initial Measurement Period. Employee A’s Initial Measurement Period runs from June 1, 2015, through April 30, 2016. The Administrative Period associated with Employee A’s Initial Measurement Period ends on June 30, 2016. Employee A has an average of 30 hours of service per week during this Initial Measurement Period. The regulations state the conclusion to each question is the same. Employer Z uses an Initial Measurement Period that does not exceed 12 months; an Administrative Period totaling not more than 90 days; and a combined Initial Measurement Period and Administrative Period that does not last beyond the final day of the first calendar month beginning on or after the one-year anniversary of Employee A’s start date. Accordingly, Employer Z complies with the standards for the Initial Measurement Period and Stability Periods for a new variable hour employee. Employer Z will not be subject to an assessable payment under section 4980H(a) with respect to Employee A for any calendar month from June 2015 through June 2016 because, for each month during that period, Employee A is otherwise eligible for an offer of coverage and because coverage is offered no later than the end of the Initial Measurement Period plus the associated Administrative Period (July 1, 2016). Employer Z will not be subject to an assessable payment under section 4980H(b) with respect to Employee A for any calendar month from June 2015 through June 2016 because the coverage Employer Z offers to Employee A provides minimum value. Employer Z will not be subject to an assessable payment under section 4980H(a) or (b) with respect to Employee A for May 2015 because an applicable large employer member is not subject to an assessable payment under section 4980H with respect to an employee for the calendar month in which falls the employee’s start date if the start date is on a date other than the first day of the calendar month. The regulations are accurate for the specific example of an employee with a start date of May 10, 2015. However, as discussed above, an employer is restricted to five scenarios in using different measurement periods for different employees. Therefore, an employer’s Initial Measurement Period needs to be compliant for each date of the year. Unfortunately, the final regulations examples discussed above fall short of this high standard. The issue with the second example in the final regulations is if an employee starts on the second day of certain months, the rule restricting the Administrative Period to 90 days will be violated. In the second example, in the final regulations the Administrative Period occurs entirely after the Initial Measurement Period and can last a partial month plus two calendar months. 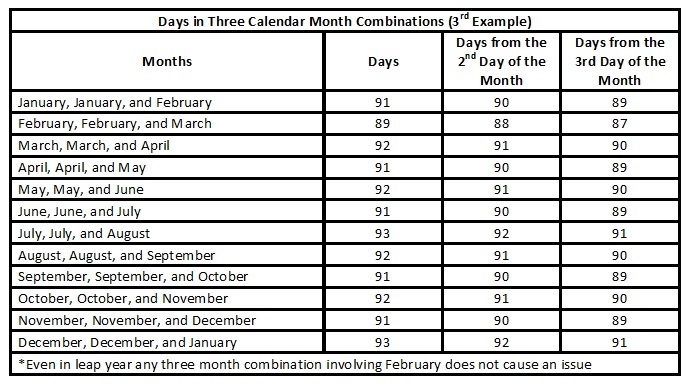 Therefore, when examining whether the rule restricting the Administrative Period may be violated there are 12 consecutive calendar month combinations that need to be examined. This is shown in the chart below. 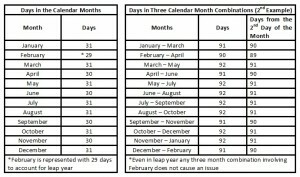 The chart on the left is a list of the calendar months and the number of days in each calendar month. 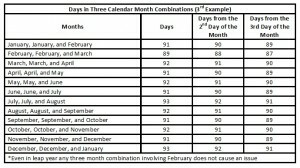 The chart on the right represents the combinations of dates in three calendar month increments. The chart above illustrates an employee with a start date of March 2, May 2, June 2, July 2, August 2, October 2, or November 2 would violate the rule restricting the Administrative Period to 90 days. So while the specific example provided in the final regulations is compliant, an employer using the example’s Initial Measurement Period could be penalized for hiring an employee on seven dates in the calendar year. This could subject the employer to a penalty under section 4980H for each full calendar month during the Initial Measurement Period and associated Administrative Period. The first issue with the third example is the Initial Measurement Period begins “…on the first day of the first calendar month beginning after the start date…” The word “after” is too powerful in this example as it allows for the possibility of an Administrative Period that lasts three calendar months. An Administrative Period that lasts three calendar months is a problem when coupled with an 11 calendar month Administrative Period as it will always violate the rule that restricts the Initial Measurement Period plus the Administrative Period extending beyond the last day of the first calendar month beginning on or after the first anniversary of the employee’s start date. Consequently, a new employee with a start date on the first day of the calendar month could subject the employer to a penalty under section 4980H for each full calendar month during the Initial Measurement Period and associated Administrative Period. Instead of using “after” alone the phrase should be written as “on or after”. This language would solve the first issue. Additionally, the third example creates a similar issue to the second example which is illustrated in the chart below. The third example has an Administrative Period occurring before and after the 11-month Initial Measurement Period. Consequently, the pertinent months to examine for determining if the rule restricting the Administrative Period to 90 days will be violated are the month of the employee’s start date (twice) and the month following the employee’s start date (once). This is illustrated in the chart below. The chart above illustrates an employee with a start date of March 2, May 2, July 2, July 3, August 2, October 2, December 2, and December 3 would violate the rule restricting the Administrative Period to 90 days. Additionally, if the “…on the first day of the first calendar month beginning after the start date…” is not corrected to read “…on the first day of the first calendar month beginning on or after the start date…” each employee with a start date on the first day of the calendar month would violate the rule that restricts the Initial Measurement Period plus the Administrative Period extending beyond the last day of the first calendar month beginning on or after the first anniversary of the employee’s start date. This totals 20 dates during the calendar year for which an employer could be subject to a penalty under section 4980H for each full calendar month during the Initial Measurement Period and associated Administrative Period. In the end it is unknown if the government will take such a strict enforcement position for scenarios involving missing a rule by a day or two. However, as an attorney, my view is strict compliance is always the best course of action. There are myriad similar pitfalls in the regulations employers (or companies hoping to assist employers through technology platforms) need to think about. If not, an employer may encounter unexpected penalties.